In order to improve our understanding of meteorological conditions and our evolving climate, five weather stations were set up in the Natural Reserve in 2015 (Photo credits: RNNHCJ). Located in the mid-European zone and more precisely, in the Alpine domain, the High Jura summits come under the climatic influences of semi-continental mountain and sub-alpine elements, where precipitation is oceanic in nature. Several variations in climate can be seen in the High Jura. This chain of mountains, of north-east/south-west orientation, acts as an orographic barrier almost perpendicular to the fronts induced by Atlantic depressions. 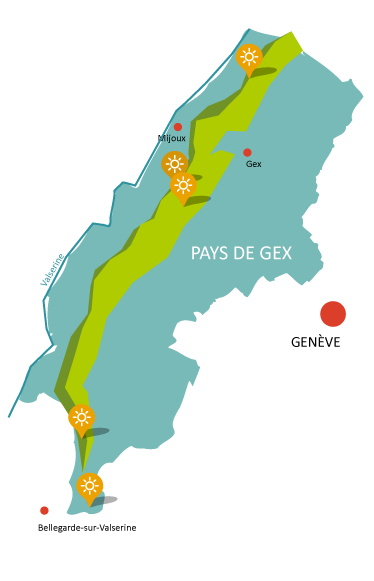 These climatic conditions represent quite a contrast between Pays de Gex to the east and the Valserine Valley in the west. The Natural Reserve ranges in elevation between 550 metres to 1,718 metres in altitude. This range of altitude results in strong climatic modifications. This can equally be said of the variations between the north, often referred to as “The Taiga of the High Jura”, and the south, where a Mediterranean influence, aided by the Rhone valley, is felt right up to the foothills of the Valserine Valley and on the south facing slopes of the Crêt d’Eau. In order to improve understanding of the meteorological conditions and our evolving climate, as well as the eventual impact at the level of the National Natural Reserve of the High Jura, (RNNHCJ), a network of weather stations has been established on its territory. This network consists of 5 weather stations covering the territory from North to South, and from East to West, at differing and complementary altitudes (La Vattay, Lélex, Montoisey, Léaz and Upper Sorgia). 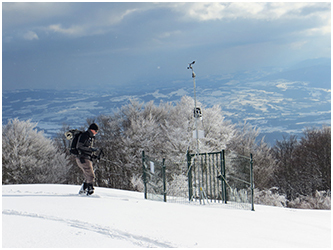 The installation and monitoring of these stations is carried out in partnership with ROMMA (the weather observation network for the alpine massif – Réseau d’observation météo du massif alpin). The meteorological data is available in real-time (not projected) and is also archived in order to preserve the historical data and to further understand the climatology of the station. It can be accessed at this website: www.romma.fr.